I'm surprised I haven't found this before. This is a very useful website for specific news about different cryptocurrencies all in one place. I know that I can find it frustrating at times to keep tabs on the different crypto projects that I've invested in especially if there is a hard fork, an airdrop, or a coinswap that I wouldn't want to miss. 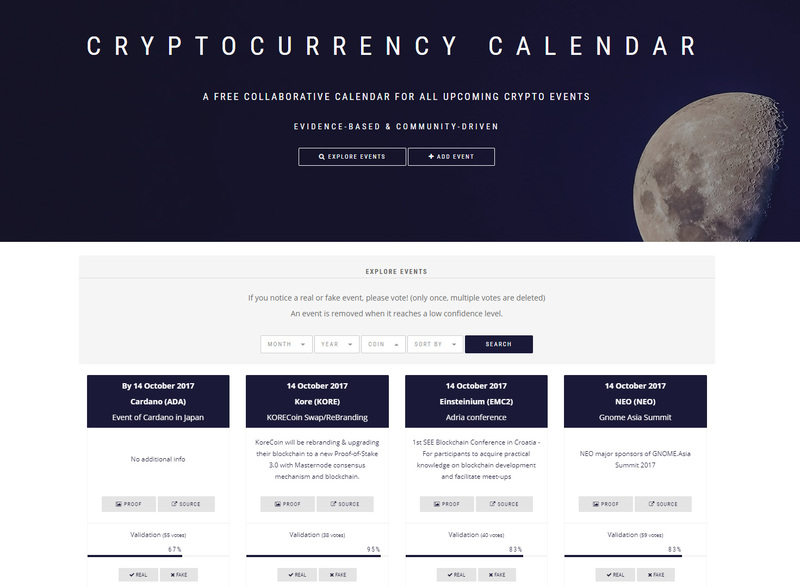 https://coinmarketcal.com/en/ This calendar allows anyone to create an event, tag the source of the event, and then later have it voted on to verify the accuracy of the event scheduled to take place. For example, if you select ETH from the drop down menu and then you hit the search icon (magnifying glass) then you will be able to see all of the 'community added' planned upgrades or news surrounding Ethereum. You will be able to see that there is an Ethereum Classic vision hard fork scheduled to take place on January 11th with a confidence rating of 72% right now, and the Constantinople hard fork is scheduled to take place at block #7080000 with a confidence rating of 91% according to people that voted on this event. I know the Constantinople upgrade is scheduled to happen soon. This is a useful website because you are able to tag multiple cryptocurrencies at once and see some important news for your for your 10 favorite coins all at once. I don't think all of the information here is perfect and they don't have every coin available right now, but they plan on listing every coin that is currently listed on verified exchanges. There are definitely some important events that will be missing for your favorite coins as well, but they encourage you to add events to their website and then other users will vote on the accuracy of the event you wrote about. If you're looking for a good way to keep track of any coinswaps, mainnet dates, or to create a catalog for yourself of upcoming events for your favorite coins you hold then this is probably a good way to set that up. I think if awareness of this website spreads then there will be more events added for each coin here and also the accuracy of the events added will likely improve, so passing on the word about this website would be a good idea. I'm not getting paid to promote this website, I just found it today browsing around on the internet. You are also able to get some e-mail notifications about coins if you provide your e-mail address, but it seems like this is a work in progress website that could use a few improvements. Also, they have a newsletter that they send out every few days about a few coins to watch closely because of upcoming events or technical analysis. Lastly, they also have a dark mode that you can toggle on an off at the very bottom of the page. ***This website gets its info from community contributed content, so if you see hardforks, mainnet dates, or just big news missing for your favorite coin or token then please add it to the website because that will create more accurate content. It's really your choice, but it would help. I appreciate all your frequent comments on my posts. Thanks @Obest! this will help ... Are there only these ! ! This is pretty cool thanks. Good find on this one, added to my bookmarks! Yeah, basically. It's kind of a work in progress website, but if everyone contributes content, then the website will have more accurate information. Really gonna help. But looks like there's nothing on Cryptocurrency Arbitrage on there. Cool website. Would use it to keep in touch with my portfolio. thanks for sharing! will look into it. great way to monitor my coins! good for ol' forgetful me..
this will greatly help. gracias! Thank you very much! I was looking for something like this! yes, it's very good now let's hope see all coins green again!!! Excellent tool, thanks for sharing! Hey, I noticed you are using BlockTrades for large transactions. They place a 5% - 8% premium on transactions. That equates to $100 - $160 on a $2,000 transaction. That's expensive. Since you're making large transactions, I think it'd be better if you buy on a spot exchange like Binance and just transfer the STEEM to your account. Ok, thanks for the tip. Steem transactions are supposed to be free, but with Blocktrades they aren't. Blocktrades makes it easy, but you're right I should save myself the money.